Adobe has been offering graphics and desktop publishing software since Illustrator debuted on the Macintosh in 1987. Over the years, the Adobe product line has expanded to include offerings for nearly every aspect of digital and print publishing. Adobe applications provide the capability to create text and graphics for websites, create digital graphics and edit images and photos. Adobe products have become the de facto standard in the publishing industry. To help ensure users have access to the best tools for the job, Adobe created a package of products called Creative Suite, now referred to as Creative Cloud. These tools provide the most robust solution to each of the different areas involved in comprehensive graphic design. Let’s go over the tools in the suite and discuss what they are and how they differ from one another. 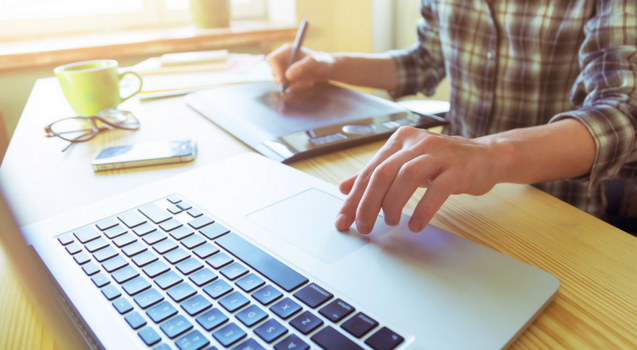 Illustrator is designed to create vector-based graphics such as logos and brand markings that can be easily resized without pixelating or losing their detail. When you need to create dynamic illustrations that might be used in any number of different contexts and locations, Illustrator is the go-to application. However, Illustrator does not lend itself to fully editing photographs or building complete documents. If you want to edit photos or even build web pages and graphical user interfaces, then Photoshop is the application most suited for you. Photoshop uses raster or pixel-based images, which is great for photos, but not great for logos and other types of graphics that need to be resized. This tool can help you color, sharpen, blur, darken, as well as add and remove image components from any image. But take note, if you’re looking to create projects where you need to organize photos and add content to them, Photoshop is probably not the best tool in the bag. However, Elements is perfect for this task. This tool, best when used in conjunction with Photoshop, helps you to format your pictures and into a final product. Elements can combine your photos into collages, calendars, scrapbooks and many other types of projects containing images. It provides effects such as painting directly onto the photograph or manipulating different aspects of the photo, and there are tons of filters that can be applied to fulfill your artistic vision. Even though it is possible to create printed materials with Elements, it isn’t the most powerful tool for printing. InDesign is the printed document application in the Adobe stable of graphics tools. If you need to print books, brochures, pamphlets, business cards or any project that combines blocks of texts with images, InDesign is the Adobe tool best suited for the job. While you can create documents in the other tools, InDesign is designed to keep text clear during printing. It is also geared to work with commercial printers and produce smaller files that can be quickly transferred to network printers. Some of the other tools produce huge files that are harder to work with when creating multi-page documents. InDesign is the tool that you can use to bring everything together after your images or logos have been created and organized with the other tools. Mastering these very powerful graphics tools from Adobe could prove to be a large task. However, mastering at least one of them could prove to be very beneficial. Graphics design is one of the most sought-after careers in technology today. Knowing how to use one or more of these tools can open great career opportunities. The best way to learn how to use these tools is to obtain training through a training center like ONLC. Chances are we a have training center near you so why not contact us today and get started on the path towards your new career?